Now that the large snow mounds have finally melted here, we can see what they have been hiding for the past few weeks -- a lot of trash. Driving down my everday roads I have noticed milk cartons, water bottles, newspapers and other trashy things lying along the roadways. I saw one man, wearing a blaze orange safety vest, collecting these items yesterday, hopefully disposing of them in the right manner. Kudos to him. 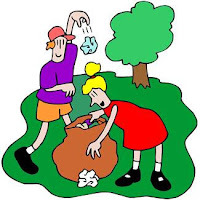 When my sons were young, I would always send them out with a bag in hand on a spring day -- after some of the mud had dried up -- to gather up all of the trash that had blown into the yard and down over the hill throughout the winter. We also usually found a lot of balls that had never made their way into the garage after being played with. Guess I will have to don my mud boots and get out there and start picking trash up, along with the dead branches that have fallen from the oak trees. I don't think this is what anyone means by "spring cleaning," but it qualifies. Watching birds this morning at my feeders I thought about how much we are like them. Each of the birds hangs out in the tree tops for awhile, checking out the feeders and making sure no predators are nearby. They eventuallly fly to tree limbs that are closer and then closer still, their heads moving constantly to see what and who's about them. 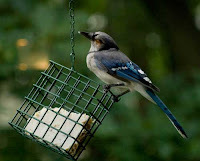 Finally, they make that last flight onto the feeders and peck away at the suet, still swiveling their heads constantly. If they feel or see the slightest thing that scares them, like someone walking inside the house or a change in the light, they will fly away quickly to their farthest perch and then begin the bird ballet again. We are a lot like that. We are wary of new situations, even at our age, when we have lived through most. It's OK to be wary and to be careful, but it shouldn't keep us away from the prize -- suet for the birds, joy for us.